Welcome to the Peace unit! 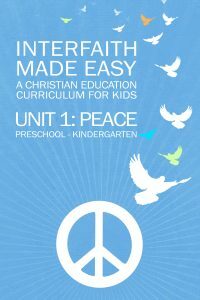 The Peace unit of our interfaith curriculum is designed for Christian Educators, although it can be easily adapted by almost anyone, including caregivers/families, interfaith centers/camps, and educators from other faith traditions. The unit consists of 15 lesson plans: an Introductory lesson, one Old Testament/Hebrew Bible lesson, five New Testament/Christian Bible lessons, and eight lessons from other cultures/traditions (Buddhist, Hasidic, Native American, Islamic, Sanatana Dharma/Hindu, Sub-Saharan African, Sikh, and Sufi). 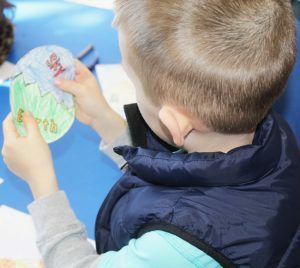 Each of the 15 lessons consists of age-appropriate background information, a Bible passage or story, at least one craft, and at least one activity. We also provide Review sections at the beginning and Take-Home Opportunities at the end of each lesson. Lesson plans are designed to last about 60 minutes, but they are readily modified for sessions lasting anywhere from 45-75 minutes. Faith, then, is a quality of human living. At its best it has taken the form of serenity and courage and loyalty and service: a quiet confidence and joy which enable one to feel at home in the universe, and to find meaning in the world and in one’s own life, a meaning that is profound and ultimate, and is stable no matter what may happen to oneself at the level of immediate event. Our goal at Faith Seeker Kids is not to produce “happy” kids or mini-religious scholars. Our goal is to provide kids with the tools they need to walk their faith path – whatever that looks like and wherever it might lead. The Christian Bible serves as the foundational text for this curricular unit. The younger groups (Preschool-Kindergarten and Lower Elementary) hear stories based on Biblical passages that focus on peace. The older groups (Upper Elementary and Middle School) hear/read the actual Biblical text. We do not view the Bible as the inerrant word of God, and we do not require that it be taken literally. Instead, we view the Bible as a compilation of very old stories and myths that provide our children with opportunities to connect with their ancestors, to ponder how humans relate to one another and the world around them, and to understand more fully how people might view God/the Divine/the Great Mystery. And we fully expect the kids’ interpretations to vary over the course of development. Caregivers and educators in every other major faith tradition in the world use stories when teaching their kids. In some cases, these stories have been shared with children for centuries – passed down from generation to generation orally, eventually put into writing, and eventually translated into English. We have the tales of the Panchatantra (from the Sanatana Dharma/Hindu tradition); folk stories from indigenous traditions; the Jataka Tales (from the Buddhist tradition); and legends about the Sufi masters, the Hasidic rabbis, the Prophet Muhammad (from the Islamic tradition), and the 10 living Gurus (from the Sikh tradition). 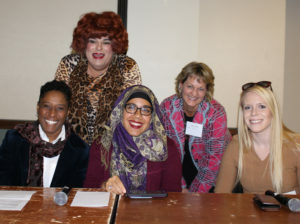 Narratives also help us avoid many elements – like creeds, doctrines, tenets, and within-tradition differences – that impede religious discussions among adults. And since we wrote our own versions of these peace tales, we included questions along the way to keep kids of all ages more engaged. In all the different faith traditions, kids acquire knowledge through experience. Our experiential elements have therefore been inspired by Buddhist sanghas, Jewish communities, Hindu craft web sites, Islamic centers, and Neo-Pagan/Wiccan gatherings. All our crafts and activities make use of inexpensive, readily-available supplies. Most everything can be bought at your local craft store (if you don’t already have them on-hand). We also suggest the use of recycled/recyclable materials or items from nature where appropriate. In addition, we’ve include suggestions for maintaining the Peace theme throughout the classroom session — either by incorporating an opening/closing ritual or by integrating group processing techniques before and after various parts of the lesson. Most importantly, we view these experiential learning techniques as ways for kids to be co-creators with the Divine. We want them to be innovative and resourceful. We want them to use their imaginations. And we want them to be inspired, not just by their own creations, but by the creations of their friends and peers, as well.